I'm off today to JFK for my first of four Singapore Airlines flights. I had never flown SQ before, let alone an SQ RTW. After learning from FT about the great all SQ-metal FEZSQ fare of $6,700 (currently $7,100 including all taxes and surcharges), I decided to take my Dad on a 5 day RTW for his 80th birthday. But first we both need to get to JFK. 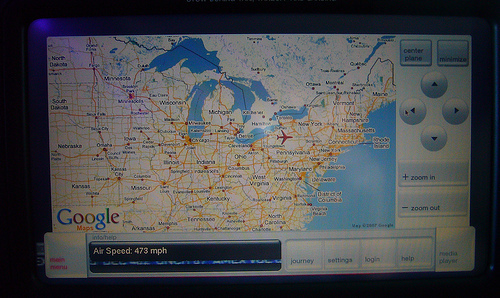 Dad on a short Delta Connection flight from YUL, me a Virgin America transcon from SFO. I always like departing from SFO's relaxed and clean International Terminal. And I even had a chance to help a traveller in need. Just after a friendly gate agent introduced herself and her colleague to those gathered at the gate area, a young woman took the seat beside me and immediately started looking thru her pockets and purse mumbling "where is my license?". Since I had noticed an elderly couple pick up a drivers license as we were all walking to the gate, we walked back towards the terminal and I found the couple, and her license. Priority boarding with usual personable FAs greeting us. Water, blankets and pillows were waiting at our seats, followed by offers of additional drinks, all before the Y cabin boarded. On time push-back short taxi and wheels up by 7:15A. Pre-breakfast drink, following by breakfast appetizers choices of cheese, watermelon cubes and the most yummy yogurt smoothie (cereal-coconut-strawberry-apricot-grape-raisin-apple) I have ever tasted. Banana bread or blueberry muffin, although heated would have been nice. The frittata with artichoke and peppers was quite tasty... although I did a double take at the artichoke that looked like it might have been alive at one time. 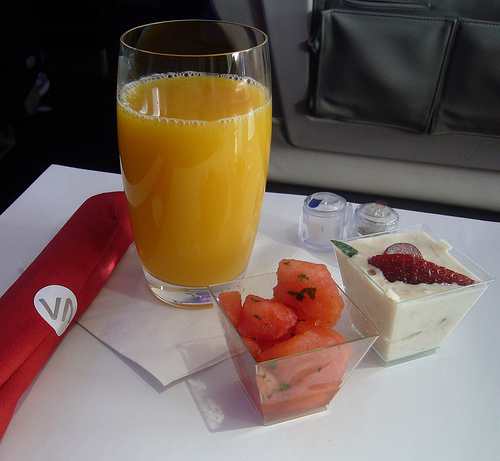 As with every VX flight I've ever been on, FA service throughout was excellent, with multiple stops to inquire if I needed a refill or anything. 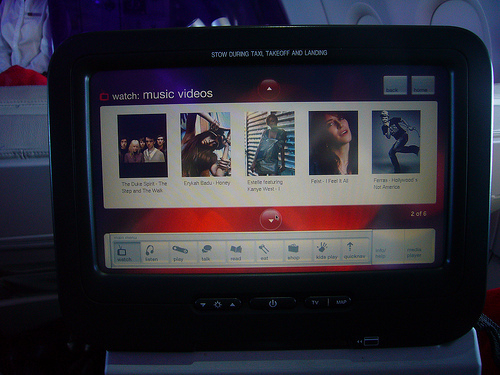 Sat back, relaxed, turned on VX's terrific IFE Red, programmed my own playlist and enjoyed the rest of the flight. The only annoying aspect of the flight was the constant stream of Y pax to the F lav and the non-enforcement of the "F lav for F pax" directive announced prior to departure. On time arrival and a short five minute walk to the VS Clubhouse. I met Dad at the VS Clubhouse just after 4PM, some 5 hours before departure and before the SQ counter opens. Wow, what a treat the JFK Clubhouse is! Conveniently and conspicuously located before security on the check-in level, with a great open and spacious feel. Thanks to FTers, we identified ourselves as SQ First and were welcomed in... "oh, your dad is here already and having a martini"... as the Clubhouse staff already had the SQ F manifest. We enjoyed four hours there catching up, drinking and eating a pre-departure snack, all the time served by a terrific Clubhouse staff, but most notably the outgoing, hard-working and over-the-top accommodating Nikki. ... BUT, the abysmal boarding experience was not the best first front line impression... "third world" like gate A6, an abundance of summer gate lice and a ridiculous priority boarding call for "families with small children, elderly and anyone needing special assistance as well as our First Class and Business Class passengers, Silver Kris and PPS members". Well that only covers half the freakin' plane! Hey let's have a scrum and then just use one door, the mid cabin door, to board. As we finally made our way on board, our wonderful SQ experience began. As soon as he saw our F BPs, an FA at the door greeted us by name and took our bags leading us to the F cabin, and to our seats. Sure the seats are old, the decor dated, boring and monochromatic brown, and there seems to be a lingering "smoke" smell from the days when smoking was allowed (kind of like a hotel room that was at one time a smoking room that never can shed the odor), but that was quickly forgotten as the pampering and libations began... personal welcomes, jacket hanging, luggage stowing, magazines, newspapers, Dom, PJs, amenity kit, more Dom, socks, eyeshades, Bose headsets and more Dom. Now I know why the new F seats are 35" inches. When the crew learned that we were father-son on a RTW, it was pretty much 7 hours of personal attention despite a nearly full (11/12) cabin. After a relatively short taxi and take-off wait (only #5 in queue) we were off. Hot towels and drink orders... Singapore Sling for me, wine (the Cos) for Dad. For the second round, I switched to champagne... choice of Dom or Krug, I opted for Krug, Krug and more Krug. 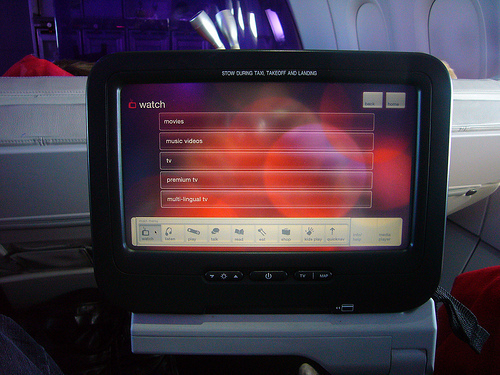 Familiarized myself and played with the IFE... not the latest, greatest or most user-friendly, but with all the distractions of my first SQ flight, traveling with someone and the fact that I had just been spoiled by Red, I hardly used it at all. Perhaps on the longer flights, it might be more of an issue. Then our two hour marathon dinner service began. Dinner menu selections taken. I had pre-ordered the Lobster Thermidor thru the SFO ticket office, so the choices were pretty easy. Who knew that setting the table in flight could be so elegant? The sturdy wooden table slides out from the cabinet at the front of the suite. Each item carefully and precisely placed on the table. Warm bread & roll offering... no, that ramekin of butter is not a soup bowl, just playing with my camera. Started with the caviar. Unlike LH, no cart and the option to size your own portion but the sizing and condiments were just fine... although I might have opted for something other than melba toast. More Krug? why thank you. Next up, the tasty Seafood gumbo Creole soup. The bowl really was full when served but I forgot to take the picture before starting. Then the Caesar, not quite as fabulous as the one in the Clubhouse, but very good. OMG... the Lobster Thermidor was to die for. Add in more Krug and it was heaven. Now at some point during dinner, perhaps around the 5th or 6th glass of Krug, the "Chief Stewardess" stopped by to become our new best friend. Lots of photo ops, phone number, email address and offers to be our tour guide in Singapore. "I'll be in San Francisco next month". Uh-oh! Like, I'm going to tell my wife about this... my new BFF and own Singapore Girl. And since she told me that she had "personally picked up the Cheesecake today at the Carnegie Deli", I felt obligated to finish it. I know, its a tough life but someone has to do it. Feeling completely stuffed, I called "no mas" after the cheesecake and declined the cheese and port, or fruit. There's always tomorrow, a 12 hour 77W and the New First Class to SIN. A short nap and juice and fruit for breakfast and we were in Frankfurt... some 35 minutes early. Unfortunately, we were banished to the penalty box... captain blamed it on the weather (mostly sunny ) and LH occupying our gate. Personal good-byes and thank you for flying SQ from all 4 FAs who worked the F cabin, and hugs and kisses from the Girls for Dad... no pics of that though. One of the FAs carried Dad's carry on down the stairs for him and we boarded the bus for the short ride to the terminal. At least it wasn't CDG where the bus drivers must surely be paid by the km. After all the hype and anticipation, I had wondered whether it could possibly be that good. And it was indeed. Even with the dated hard product, the soft product is simply amazing... probably the best single in flight experience and in flight crew I've ever encountered. There is just a style, a grace and a feeling that the SQ "Girls and Boys" truly love what they do. Our driver picked us up at the airport and gave us a tour of Frankfurt before we checked into our hotel. Our comfortable 3.5 hour train ride to Zurich. Our driver met us at the train station and gave us an hour and a half private car tour of Zurich before dropping us off at the airport at 6PM. Wow, where do I start on this one? In summary... the best flight I have ever experienced, period! I selected this flight because I wanted to fly the 77W and "The New First Class", and the FRA-SIN 77W was sold out in A. 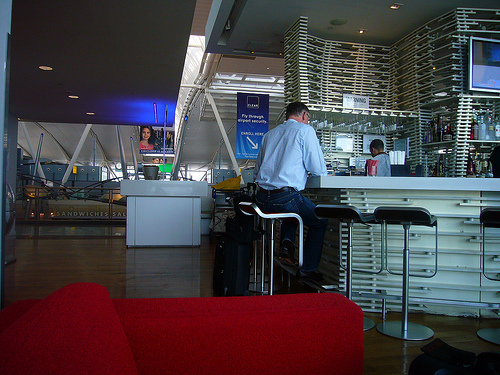 After check in and passport control, I opted for the SWISS Lounges since it was the closest. Tried to talk us into the HON lounge but the ornery LX dragon-lady was not buying it especially since LX had a ZRH-SIN flight leaving 40 minutes later than ours, so we headed left into a virtually empty Senator Lounge. I showered upstairs in the HON and noticed no discernable difference between the two including the food offerings which looked pretty lame. Departure was from the new mid-field terminal and in stark contrast to the chaotic boarding at JFK, classes were separated at the gate and First and Business were priority boarded. 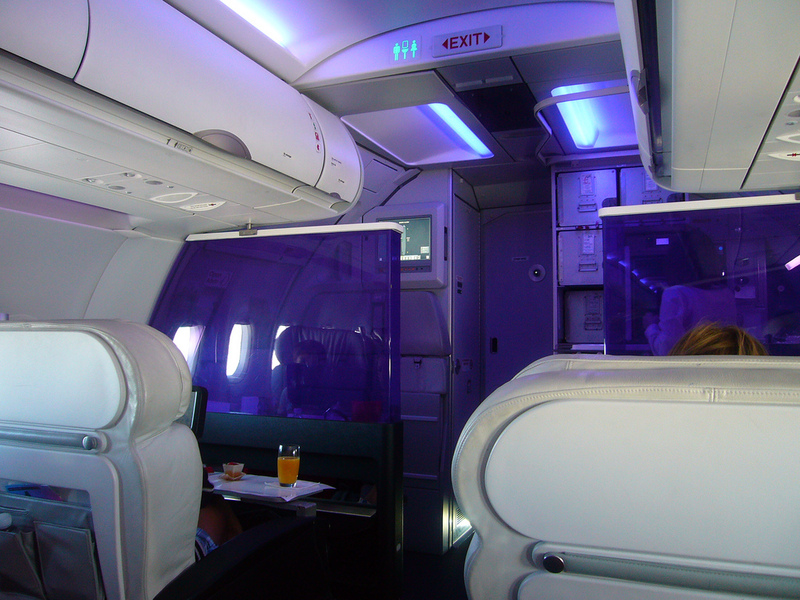 Double jetways were in operation with a separate jetway for the 8 First Class pax. As we walked toward the door, one of the 3 First Class FAs came up the jetway to meet us and help with our carry-ons. Great first impression on stepping on board the 77W with an elegant entry and galley area. The new First Class suites are incredibly spacious...35" seats, front of suite console which included a 24" LCD TV, counter top, another seat level counter with space to stow both carry-on and brief case. We had the middle two which are great for a twosome. If I were traveling solo, I would opt for one of the four window seats. 3 fabulous and friendly FAs for 8 F pax, 2 Boys and 1 VERY attractive Singapore Girl. Each stopped by to personally introduce themselves and each and every time they spoke to us they prefaced it with "Mr. SFO, ..."
Did I mention our Singapore Girl? Mushroom soup with spices... best I've ever tasted. Did I mention our Singapore Girl Adeline? Not on the menu itself, but a surprise from Georges tonight, Insalata Caprese in a bowl. After the Krug, I opted for the delicious 2006 Beaune du Chateau Premier Cru for my first three courses, then the excellent 1999 Chateau Leoville Polferre Saint-Julien, and finally Dow's 20 Year Tawny. Pan seared beef filet served with green peppercorn sauce, sauteed wild mushrooms and baby spinach. Melt in your mouth, could have been a tad rarer but I'm not going to quibble. Nut biscuit savarin with praline cream, absolutely to die for! Selection of fine cheeses and garnishes... offered on a tray with a name flag placed in each cheese, of course we're SQ. Off to the lav to change for bed (while they convert my seat to a bed) and 3 preventative Tylenol. And wow, not just any old lav. The F lavs on the LH 340s are nice and big, but the SQ 77W F lavs are lots of mirror with wood, chrome and polished brass. Actually it looks like gold but even SQ wouldn't do that. Would they? Slept like a baby for 5 hours in a most comfortable 6.5' long bed. Worked a little in bed as I sipped on a couple of glasses of freshly squeezed OJ. 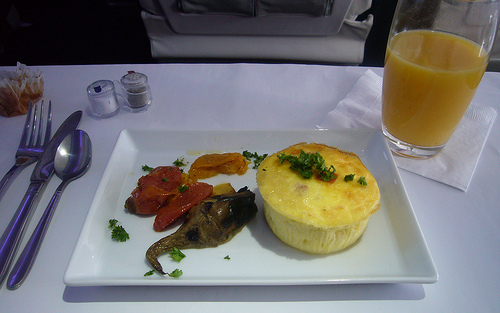 Then, since the seat belt sign was on for some turbulence, the crew served us "breakfast in bed". And the delicious Pork congee, Singapore style sliced pork and meatballs in rice porridge with deep fred Chinese cruellers. Some daytime pics of the cabin just prior to landing, including hard-working Adeline, our SG. Prior to landing, the FAs all stopped by to say good-bye and thank us for flying SQ. Thank us? Thank you for giving us a memorable 12 hour flight. And as I mentioned earlier, the best flight I've ever had the pleasure to experience. Upon arrival, we disembarked thru the F jetway where a lovely JetQuay Girl (not to be confused with our lovely Singapore Girl) was waiting for us and sped us thru the terminal on a red JetQuay golf cart. I had read about this service in a nearby thread and thought it would be good with my dad, since the walks thru the terminals are at times tiring for him, not to mention slow. Our JG stopped so I could use the ATM and we arrived at the JetQuay/CIP terminal some 5 minutes after pick up, all without leaving the AC of the main terminals. Four JetQuay employees met us, walked inside their terminal to clear C&I (20 seconds), loaded our bags in the limo (at the curb right outside) and gave me a tour of their facility, which included plush lounge areas, conference rooms, gym and spa center, kitchen and bars. All this for S$107 total for both of us! Forget the SQ FCL, we booked JetQuay for our return tomorrow... they have their own security station and passport control, and will beep-beep us right to the gate. A short overnight in Singapore at the Mandarin Oriental, just enough time for a relaxing dinner and sleep. After our great experience yesterday with Changi JetQuay on arrival yesterday, the departure experience was even better. After a short 20 minute ride from the MO, our limo driver pulls up to a tree-lined, very secured entrance to the CIT terminal just at the end of T2. ... and no more than 100 feet from the front door into the JetQuay Lounge where three more JetQuay Girls greet us. I could so seriously get used to this. We surrender our passports at the front counter and are then escorted to one of dozens of comfortable seating areas. We are the only two people here this morning, unlike on our arrival yesterday when the place was pretty busy. One of the JetQuay Girls brings us OJ and coffee. Ten minutes later, another JetQuay Girl returns our passports (stamped "Departed", by the in house C&I staff ) together with our burgundy FC SQ BPs. She asks if I'd like a tour of the facility which includes a business center, at least 30 computer stations with open internet access, showers, conference rooms, and 4 nap rooms. 50 minutes before departure, our JetQuay Girl comes for us, with a JetQuay Boy to handle our carry-ons. We ride the elevator up one floor to the terminal level where we board our electric cart for our trip to T3, about 2 miles but no more than 7-8 minutes away. We stop along the way for a photo op and some shopping. I told you she was lovely. We then proceed to T3 and gate B4, where we say our good-byes and enter B1-B4 security. She stays at the entrance until we clear security and then waves good-bye. All this for SGD 107!